Nervous about your first jetski ride? You know that jetski isn’t for the faint-hearted. If you aren’t that brave but you have insatiable thirst for thrill and fun, wave riding is for you. It only takes a 10-year-old’s intelligence to figure out how it works. A great friend told me that jetskiing isn’t just for the rich. If you’re in Dubai or Sharjah, you must have seen plenty of jetski riders at Mamzar’s open beach, lying at the border of both Emirates. If you look it up on the internet, jet ski rental fee per hour ranges from 200-300 AED. But if you’re a savvy negotiator, you can ride one for 100 AED/hour. Do some bargaining. I usually spend my weekend around my tiny room peering through the wide window of the WWW (through my laptop, as you’ve guessed). Good friends know when and how I should break that monotony: Jetskiing! So how can one ride a jetski for the first time and not break a single joint or strain a muscle? Easy. Ask for instructions. 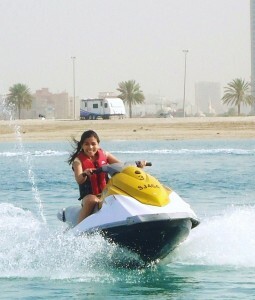 I haven’t ever driven a motorbike but I’m happy I managed to ride a jetski. Understand how the controls work. Note that there will be controls for the engine, for a stop, and for speeding up. The only intangible control lies inside your heart. Whenever you’re driving fast, it is sure to skip a beat. How to Win a Japanese Friend?